The oldest bar in Lexington, Kentucky has decided to embrace its inner Robin Hood—well, sort of—by making one of the country’s most sought-after spirits available at cost to anyone who shows up. It’s very cool. It’s surprisingly generous. And it’s a very, very savvy bit of marketing. Chevy Chase Inn, which sits on Euclid Avenue, recently received its allotted share of the 2018 crop of Pappy Van Winkle. A 2012 Garden & Gun piece notes that as many as 7,000 cases are released per year. That may sound like a lot, but as Julian P. Van Winkle III put it to Garden & Gun, that’s “about what Jim Beam puts out in 10 minutes. The bottles are distributed twice yearly; they end up in about 300 liquor stores across the country, and waiting lists can be very, very long. Bottles can sell for many thousands of dollars, but hey, you might be able to afford the empty bottle with velvet bag currently available on eBay for $200. So on Sunday the 18th—that’s this Sunday, Kentuckians and Kentucky-adjacent readers—the bar will sell everything they received this year at cost (meaning, with no markup—just what it cost them to bring it in). 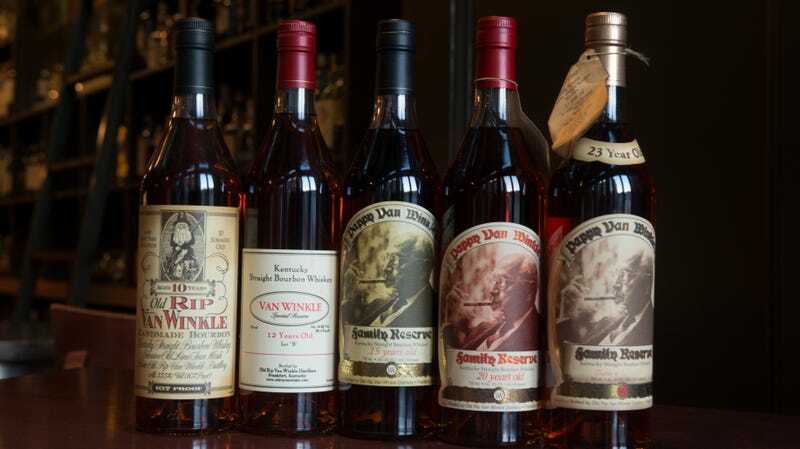 “Pappy Thanksgiving” will begin at 2 p.m., when the doors open. Everyone in line will receive a wristband and a number at that time. Then, at 4:30 p.m., they’ll sell one pour per person, assuming the person has a number. Heathcoat said that the bar can guarantee pours for the first 75 people in line. This is, no caveats, a very cool thing for the bar to do. But it’s not totally selfless. The same press release also notes that “they will also have plenty of other bourbons on hand to enjoy as they have a very respectable bourbon selection for a tiny dive bar,” and says they’ll raffle off some items donated by Buffalo Trace Distillery (P.V.W. is a Buffalo Trace brand). The idea, as you probably gather, is that once people are there, be they in that lucky 75 or not, they’ll probably want a drink, or several drinks, and they’ll probably be in the mood to try some high-end bourbon, no? We’re very glad they came up with the idea, but would humbly suggest they avoid applying the same logic to the purchase of hotels. You can find more about the event on Facebook. If you decide to brave the line, let us know!